Let's face it we all have items in our closet that we have not worn in years. Maybe you lost weight, gained weight, your style changed or it is not new and you've moved on. 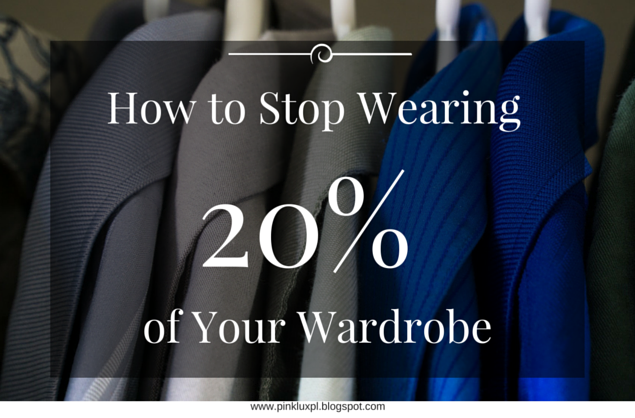 No matter the reason it is just cluttering your closet and it falls into the percentage of clothes you don't wear. I remember when I use to wear something three or five times and never wore it again. It was not because I didn't like it anymore it just didn't feel new to me or a new trend came out...what was I thinking?! We are human and naturally somethings gets old and we don't want to wear or use them anymore. When this happens try to remember why you bought that garment in the first place. Was it the color? Was it something that you needed for an event? Was it a trending item? What ever the reason fall back in love with your item if it still fits. Don't waste money on new items when you haven't given one item enough love. If you are holding on items that you haven't worn in months or years, it is time to declutter your closet. In my webinar #audityourwardrobe we really went over how to properly declutter and why you need to do this quarterly. Maybe you have clothes that are too small or too big, if so it is time to sell or give them away. Don't hold on to garments just for the sake of your closet looking like you have alot of clothes. This is the reason you may feel overwhelmed when getting dressed. Too many options are not good if your wasting time on garments that don't need to be in your closet. Do you wear your garments less more than 10 times? Do you feel like you never have anything to wear? Do you have a closet full of wasted items? If you answered yes to any of those questions you are not being creative with your wardrobe. You should not be wearing the same outfits over and over again. Mix and match items to really get the use of your clothes. If you always wear your black dress pants with a blazer mix it up and wear each piece with a different item. Be unique in your style and have fun. It always amazes me how many women don't know their perfect size. Most of my clients have never been completely measured. When they are they are surprised to find out that over 50% of their wardrobe is the wrong size. More than likely you are not wearing something because it does not fit or it never fitted properly but you didn't feel like returning it. Or worse you thought you would fit back in it with a quick diet. It is important that you know your measurements and stop wasting money on items that don't flatter your figure.